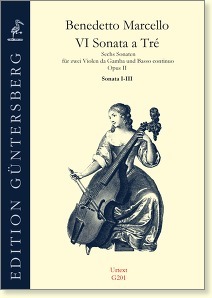 Various formations are conceivable for the viol version of these sonatas. A rendition on two bass viols and continuo harpsichord would be first and foremost. Optimal would be an additional continuo viol or (perhaps better?) a continuo cello. Finally, a pure string trio would also be charming. While composing these works, Marcello undoubtedly had above all cellists in mind. This is obvious from the final chords, which are intended for an instrument tuned in fifths. 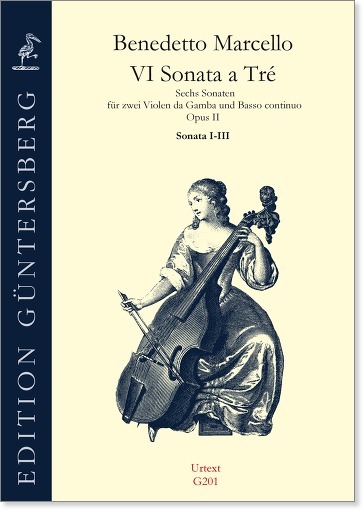 Nevertheless, with this edition we would also like to encourage viol players to find pleasure in this somewhat unaccustomed viol music from the Italian Late Baroque.